Posted by Carolyn Burns Bass in LitChat Literary Salon. It’s here. 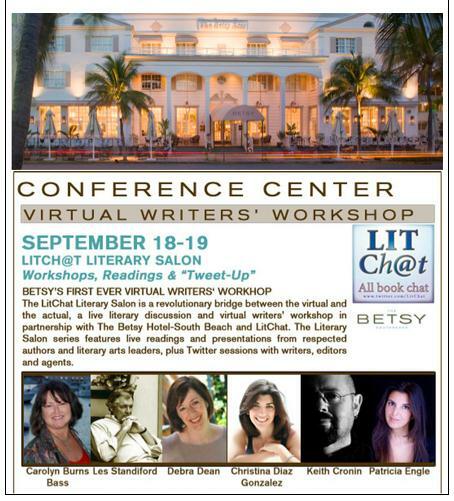 The LitChat Literary Salon is a revolutionary bridge between the virtual and the actual, a live literary discussion and virtual writers’ workshop in partnership with The Betsy Hotel-South Beach and LitChat. The Literary Salon series features live readings and presentations from respected authors and literary arts leaders, plus Twitter sessions with published writers and agents. The two-day writing, reading and literary discussion series occurs September 18-19, 2012. On Tuesday and Wednesday afternoons during the Literary Salon series, LitChat founder, Carolyn Burns Bass, will moderate a writer’s workshop through Twitter. Participants can expect exceptional writing tips and publishing information from notable authors who will tweet through a dedicated hashtag: #LitChatBetsy. Wednesday afternoon, 5-7 pmET in the Lobby Salon of The Betsy, we’ll hold our first-ever Tweet-up. If you’re anywhere near Miami on this date, we hope you’ll stop in for some light refreshments and face-to-face greetings. Historical fiction appeals to readers of all ages. In this session we’ll discuss such ideas as how historical fiction has changed through the years, reflecting the mores of the present through the lens of the past; how historical fiction creates bridges between generations; how historical fiction differs from fact-based reportage, essay or narrative non-fiction. Art informs art and artists support artists. Join us for this lively session where we’ll discuss the inter-connectedness of the literary arts and the importance of and power in a writers’ community. Click here to view the dedicated Literary Salon website.